Our good friend Charlie (Usain Again) won another race on Thursday, October 21st! For those of you that aren’t counting, that was Charlie’s fifth win in seven lifetime starts. His record now stands at 7-5-1-0, with $36,585 in career earnings. I apologize for not informing the blog about Charlie’s upcoming race, but I was afraid that the announcement may jinx him. Hopefully a few readers have put Charlie (just to be clear, his registered name is Usain Again) on their “watch lists” and received an e-mail notification of his race. I know that this blog’s number #1 fan, “Observer,” was able to cash in on Charlie’s win price of $14.20 and I hope he wasn’t the only one. The other news that relates to Charlie is somewhat disappointing. Today his half-sister by Devil His Due went through the ring at the Fasig-Tipton Kentucky Fall Yearling Sale and only brought a bid of $1,000, which did not meet the reserve. I was hopeful that Charlie’s recent success would lead to a decent sale price for his half-sibling, but unfortunately things did not work out that way. 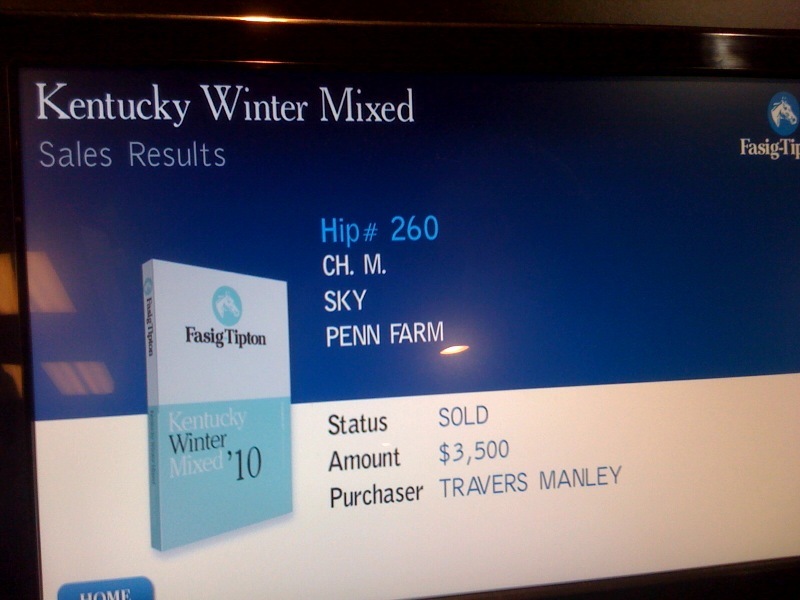 To remind you, Charlie is a Fasig-Tipton Kentucky Fall Yearling graduate of 2008; selling for $5,200 to Jose Pinchin. Both Charlie and his half-sister were bred and consigned by Maine Chance Farm (University of Kentucky). Lastly, I have one update on my life. This Friday I have a meeting with the Associate Dean of the MBA program at the University of Kentucky to discuss the program, its benefits, the application process, scholarships, etc. I’m really looking forward to the meeting and hopefully it will go well. That’s all for now. Everyone have a great week! The class took place at UK’s Maine Chance Farm and it’s purpose was to take someone with little or no horse handling experience (like myself) and make them comfortable working with horses. The class was required to be taken by all Equine Management majors and I remember hearing the moans and groans from several students in the class as our instructor gave a lecture on the proper way to groom a horse. “Why am I taking this class? I’ve been grooming horses since I was eight,” they would say. In fact, just to fit in, I recall myself throwing out a quiet, “This is so stupid,” to a few classmates. I tried to act like I already knew how to properly groom a horse, bathe a horse, and walk a horse, but in reality, I knew none of it. I was skeptical, but the instructor was not joking. He was a sweetheart. A yearling colt by Seattle Fitz (ARG), he was out of an Assault Landing mare named Charlmar, and so we nicknamed him “Charlie.” Over the next few months, I spent a lot of time with Charlie. We bonded because we were both new to everything. I was training him, but he was also training me. The relationship continued to grow throughout the semester and, in my mind, he became my horse. On the final class of the semester we had a final exam to evaluate the progress of our horses. Charlie performed beautifully and together we got an A in the class. The day of our final exam would be the last time I would see Charlie for a few months. The school year was over and I went home to Louisville for the summer. Upon returning to Lexington the following August, one of the first things I did was go see my boy. It was like we’d never left each other and I remember talking to him in his stall for close to an hour that day. Also on that day I found out that the plans for Charlie were finalized. He would be sold in the Fasig-Tipton October Yearling Sale in a couple of months. I visited Charlie at the farm frequently over the next couple of months and then October came and it was time for the sale. I went to Fasig-Tipton on the day Charlie was to be sold and, upon walking up to the Maine Chance consignment barn, the farm manager smiled and said, “He’s in the third stall on the right.” He knew why I was there. I quickly walked over to his stall and went inside to see him. He was really shined up and it was amazing that he was the same horse that I started with in the previous January. We were in the back of his stall together for a half-hour or so, and then I kissed him on the nose good-bye and headed to the stall door. I reached for the door and then felt a strong push on my back. He was pushing his nose up against my back, just like he would do everyday when I left his stall at the farm. Well at that point, the tears started to fall. Charlie was my horse, he was my first horse, and I was surprised at how difficult it was to let him go. I talked to him for a few more minutes and then finally had to leave his stall. Charlie would sell a few hours later for $5,200 to Jose Pinchin, making him the highest priced yearling offered by Maine Chance for the sale. 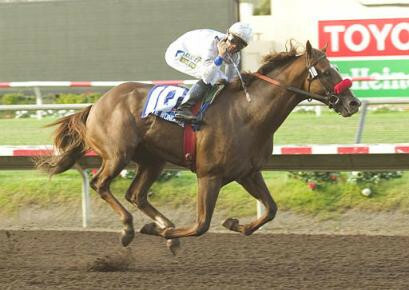 It was just under one year later that Charlie (now named Usain Again) would make his debut at Calder in a one-mile $16,000 maiden claimer on the dirt. He was in seventh place at the eighth-pole, but flew home late to get up and win by a half-length. I watched the race with my family at home and we were all screaming for Charlie as he crossed the wire first. The race can be viewed on YouTube by clicking here. Charlie would make his second start on November 7th and would improve his record to two-for-two! His second race can also be viewed on YouTube here. Charlie would then be put on the shelf for a while. After his second win, I did not see a published workout for him in several months. I was very concerned that something had happened to him, but thankfully a few months ago I received a DRF Watch alert that Charlie had put in a three furlong workout. He had been working once every few weeks for the last couple of months and today Charlie made his third lifetime start. He raced in the second race at Calder today and would go off the $1.80 to 1 favorite in a $6,250 claimer over a mile and a sixteenth. He took them gate to wire and now has a lifetime record of 3 wins from 3 starts! He also got claimed today by Fred G. Warren for Breakin Wind Farm. I’m sure that he will return in another claiming race and that this will not be the last time he is claimed. I do know that he may have many more owners over his lifetime and right now he is the property of Breakin Wind Farm, but in my mind, he will always be mine. He will always be my boy, Charlie. On Monday morning I had some time to kill before the races and so I walked over to the Fasig-Tipton sales grounds. The guys over at Fasig-Tipton really had the place polished up and it shined like a new penny. My initial reaction was, “Wow! This place is gorgeous.” The renovations definitely had my eyes wide open. I observed the newly remodeled pavilion and sales grounds for a few minutes and then moved onto the horses. At this point, I felt like I was at any other sale. There were beautiful horses everywhere, busy consignors, interested buyers, and even some tourists. One horse specifically caught my eye and it was hip #101. I was on my way to say hi to the owner of Bluewater Sales, Meg Levy, when this horse stopped me in my tracks. A beautiful bay son of A.P. Indy, this was the first foal out of champion sprinter Maryfield. I eventually made my way over to Meg, who consigned hip 101, and commented on how amazing the horse looked. She responded by saying, “Yeah, he’s a really nice colt and has the potential to be the sales topper.” Well, she wasn’t kidding because hip 101 would go on to be the sales topper; selling for $1,200,000 on Tuesday night. After speaking with Meg, I walked over to Sam-Son Farm’s consignment and requested to see hip #69 out of her stall. I wanted to take a closer look at this particular daughter of Smart Strike for one reason: her third dam. This filly’s third dam is Loudrangle and Loudrangle is the 4th dam of my mare, Sky. When they brought her out of the stall, I immediately got a great first impression of her. She was very pretty, had a great walk, and was very correct. On Monday night she sold to Glen Hill Farm for $300,000, so apparently I wasn’t the only one that liked her a lot. Speaking of Monday night, let’s fast forward to Monday at around 6:30 PM. I had just arrived back at the sales grounds after a day at the track and could feel the excitement. I walked around for an hour and finally the sale began at about 7:30. The sale started off with a bang with hip #4 selling for $775,000. Shortly after, hip #7 went through the ring and sold for $325,000. The significance of this hip was that I worked with the horse all summer. I spent time with this son of Rock Hard Ten six days a week for twelve weeks. I’m very proud to say that I had a part in prepping him for the sale and I’m happy that he sold so well. Congratulations to all of his connections and to his new owners, Shadwell. I went back to the barn area and said goodbye to hip #7 and then I headed back to my spot on the rail by the show ring. By this time, the sale was really booming and it was like nothing I’ve ever seen. I felt like I was at a big party, definitely not at a horse sale. Everyone in sight was drinking and socializing and it seemed that many were totally unaware that a major Thoroughbred yearling auction was taking place. Also, as I looked around at the people with my dad, we started to feel out-of-place. Neither of us were very dressed up and everyone else seemed to be dressed like they were headed for the red carpet. It was weird because I did happen to have a tie on, and before I arrived at the sale I figured that I would be overdressed. If I were at a Keeneland sale, or a different Fasig-Tipton sale, I probably would have been slightly overdressed. This was not the case because I apparently missed the “Dress like you’re going to meet the Queen” memo. Regardless of feeling slightly underdressed, I still had an amazing time because I was with my family and I was around the horses. I was hoping to form a solid opinion about the sale having a party feel to it, but I still have mixed feelings. It seemed to me that the horses were not the main focus of the sale, and rather socializing and looking good were more important to most. I did not like that. However, the sale did have an incredible amount of energy and a buzz to it that I’ve never experienced before at a horse sale and how could I be upset about that? It was definitely a very fun event and I think that’s great for the sport. We need to be displaying the fun, excitement, and energy of Thoroughbred racing and sales at every opportunity. We never know when a potential owner, breeder, buyer, or fan is going to see a snapshot of our sport, and so we have to produce as many good pictures as possible. The last couple of days have been very busy ones, but also very exciting. There’s a lot to write about so let’s get to it. Yesterday morning I made my television debut on the Capital OTB-TV show “Keyword: Saratoga” with hosts Seth Merrow and Steve Byk. I awoke extra early yesterday and got myself all cleaned up. I tried to eat some breakfast, but I had a stomach full of butterflies so I wasn’t very hungry. I left the hotel with my family shortly after eating half of a cinnamon roll and arrived at the set around 10 AM. The show began at 10:30 and so I had a half-hour to prepare (and by prepare, I mean try to calm myself down before going on air). I remember sitting in my chair in front of the camera, the producer counting down from five, and trying to take a few deep breaths. I was extremely nervous, but once the producer pointed at us to signal that we were on the air, the next fifteen minutes went smoothly and seemed to fly by. A big thank you to Seth Merrow and Steve Byk for inviting me on the show and giving me the opportunity to talk about Sky, Skype, and the blog on TV. I had an amazing time and I hope to someday be a returning guest on the program. I’ve already gotten a lot of positive feedback on the show. In fact, yesterday when my dad and I were leaving the track, a man stopped me and said, “You’re Travers, right?” I didn’t know the man, but I smiled and said yes. “Yeah I saw you on TV this morning! You did a great job,” he said. Well that made my day! My mom and dad told me that I did great on the show, but they’re my parents so I take everything they say with a grain of salt (sorry Mom and Dad). This guy, however, doesn’t even know me, but thought I did really well. I couldn’t stop smiling for an hour. Not only was yesterday my TV debut, but also my radio/podcast debut. I was fortunate enough to be a guest on Claire Novak’s YouBet radio blog. I discussed many of the same topics in this interview as I did on TV: my horses, how I became a fan of horse racing, my blog, etc. Thank you to Claire and producer Joe DePaolo for having me on the show. Readers: you can listen to the podcast and hear from Claire and Joe throughout the Saratoga meet at http://blog.youbet.com/claire-novak/. As I write this post, the Fasig-Tipton Saratoga sale is wrapping up. Tomorrow I will be back with a post about the sale and my experiences while walking around the sales grounds. It was an interesting sale to say the least and I look forward to hearing the opinions of other readers who were there to witness the 2010 edition of the Fasig-Tipton Saratoga Select Yearling Sale. Well I have arrived in Saratoga for another episode of “Saratoga: The Manley Family Edition.” It feels great to be back at the Spa and today I was reminded why Saratoga is the Mecca of American Thoroughbred racing. I’ve been to racetracks all around the country and nothing, so far, compares to Saratoga. Former NFL head coach Bill Parcells once said, “Saratoga is the happiest place on Earth.” I tend to agree with him. I will be giving updates on my trip and will do a review of the Fasig-Tipton Saratoga sale, but tonight I am just going to give a couple of reminders and announcements. Reminder that tomorrow I will be a guest on the show “Keyword: Saratoga” with hosts Seth Merrow and Steve Byk. The show airs on Capital OTB-TV and I will be on discussing the blog, becoming a horse owner/breeder, and my journey to “make it” in this industry. I’m a little nervous about my TV debut, but I’m really looking forward to it. I’d greatly appreciate any readers that are in the viewing area to tune into the show tomorrow. I am also going to be a guest on Claire Novak’s radio blog that she produces with Joe DePaolo for YouBet. The show can be found at this link: http://blog.youbet.com/claire-novak/. It should air in the next day, so please check this out. I got to hear a sneak-preview of the show and it’s really entertaining and informative. You don’t want to miss it! Finally, I would like to wish a happy six-month birthday to Skype. She was just one week old when I purchased her and it’s amazing to think that I’ve been a horse owner for half of a year now. Time flies when you’re having fun and I’m having a ball with these horses so time is just zipping along.